A sprain is a joint injury that causes a stretch or a tear in a ligament. Ligaments are strong bands of tissue that connect one bone to another. The anterior cruciate ligament (ACL) is one of the major ligaments in the middle of the knee. It connects the thigh bone (femur) to the shin bone (tibia). This ligament, along with the posterior cruciate ligament, helps keep the knee stable and protects the femur from sliding or turning on the tibia. Grade III sprain: the ligament is completely torn and the joint is very loose or unstable. effusion and is made up of blood in the knee joint. If you have torn your anterior cruciate ligament in an injury that occurred months or years ago and you haven't had reconstructive surgery, you may have the feeling that the knee is giving way during twisting or pivoting movements. Your health care provider will examine your knee and may find that your knee has become loose. If you have swelling in the joint, he or she may decide to remove the blood in your knee with a needle and syringe. You may need x-rays to see if there is an injury to the bones in your knee. An MRI (magnetic resonance imaging) scan may also be done and should clearly show the condition of your ACL (as well as that of other ligaments and cartilage). Put an ice pack on your knee for 20 to 30 minutes every 3 to 4 hours for 2 or 3 days or until the pain goes away. Keep your knee elevated whenever possible by placing a pillow underneath it until the swelling goes away. Take an anti-inflammatory medication or other drugs prescribed by your health care provider. Do the exercises recommended by your health care provider or physical therapist. Wrap an elastic bandage around your knee to keep the swelling from getting worse. Use a knee immobilizer initially to protect the knee. For complete tears, you and your health care provider will decide if you should have intense rehabilitation or if you should have surgery followed by rehabilitation. The torn anterior cruciate ligament cannot be sewn back together. The ligament must be reconstructed by taking ligaments or tendons from another part of your leg and connecting them to the tibia and femur. Your knee is unstable and gives out during routine or athletic activity. You are a high-level athlete (for example, basketball, football, or soccer). You are a younger person who is not willing to give up an athletic lifestyle. You want to prevent further injury to your knee. An unstable knee may lead to injuries of the meniscus and arthritis. Your knee isn’t unstable or painful and you are able to do your activities without symptoms. You are willing to give up sports that put extra stress on your knee. You are not involved in sports. When can I return to my sport or activity? The goal of rehabilitation is to return you to your sport or activity as soon as is safely possible. If you return too soon you may worsen your injury, which could lead to permanent damage. Everyone recovers from injury at a different rate. Return to your activity will be determined by how soon your knee recovers, not by how many days or weeks it has been since your injury occurred. In general, the longer you have symptoms before you start treatment, the longer it will take to get better. Your injured knee can be fully straightened and bent without pain. Your knee and leg have regained normal strength compared to the uninjured knee and leg. You are able to jog straight ahead without limping. You are able to sprint straight ahead without limping. You are able to do 45-degree cuts. You are able to do 90-degree cuts. You are able to do 20-yard figure-of- eight runs. You are able to do 10-yard figure-of- eight runs. You are able to jump on both legs without pain and jump on the injured leg without pain. you that you can return to your sport. How can I prevent an anterior cruciate ligament sprain? Written by Pierre Rouzier, M.D. for McKesson Health Solutions LLC. Published by McKesson Health Solutions LLC. You may begin with the first 3 exercises immediately. When swelling in your knee has gone down and you are able to stand with equal weight on both legs, you may do the remaining exercises. 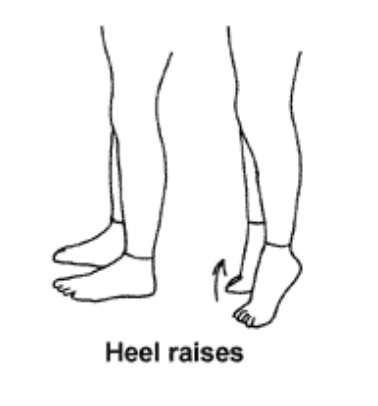 • Heel slide: Sit on a firm surface with your legs straight in front of you. Slowly slide the heel of your injured leg toward your buttock by pulling your knee to your chest as you slide. Return to the starting position. Do 3 sets of 10. 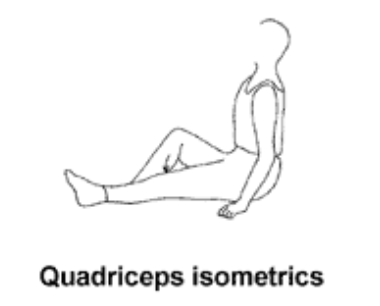 • Quadriceps isometrics: Sitting on the floor with your injured leg straight and your other leg bent, press the back of your knee into the floor by tightening the muscles on the top of your thigh. Hold this position 10 seconds. Relax. Do 3 sets of 10. 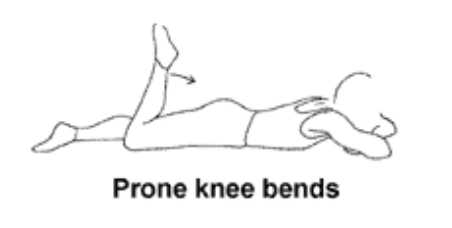 • Prone knee bends: Lie on your stomach with your legs straight out behind you. Bend your knee so that your heel comes toward your buttocks. Hold 5 seconds. Relax and return your foot to the floor. Do 3 sets of 10. As this becomes easier you can add weights to your ankle. straighten your knee. You may feel some discomfort while doing this exercise. Try to hold this position for 2 minutes. Repeat 3 times. Do this exercise several times per day. This exercise can also be done while sitting in a chair with your heel on another chair or stool. 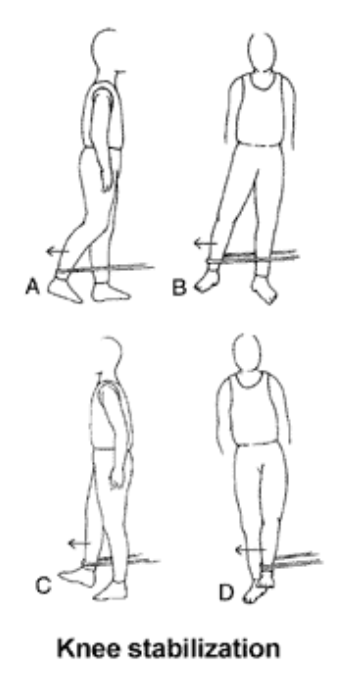 • Heel raises: Balance yourself while standing behind a chair or counter. Raise your body up onto your toes and hold it for 5 seconds, then slowly lower yourself down. Repeat 10 times. Do 3 sets of 10. • Knee stabilization: Wrap a piece of elastic tubing around the ankle of your uninjured leg. Tie the tubing to a table or other fixed object. A. Stand on your injured leg facing the table and bend your knee slightly, keeping your thigh muscles tight. While maintaining this position, move your uninjured leg straight back behind you. Do 3 sets of 10. B. Turn 90° so your injured leg is closest to the table. Move your uninjured leg away from your body. Do 3 sets of 10. C. Turn 90° again so your back is to the table. Move your uninjured leg straight out in front of you. Do 3 sets of 10. D. Turn your body 90° again so your uninjured leg is closest to the table. Move your uninjured leg across your body. Do 3 sets of 10. Hold onto a chair if you need help balancing. This exercise can be made even more challenging by standing on a pillow while you move your uninjured leg. • Wall squat with a ball: Stand with your back, shoulders, and head against a wall and look straight ahead. Keep your shoulders relaxed and your feet 1 foot away from the wall and a shoulder's width apart. Place a rolled up pillow or a soccer-sized ball between your thighs. Keeping your head against the wall, slowly squat while squeezing the pillow or ball at the same time. Squat down until you are almost in a sitting position. Your thighs will not yet be parallel to the floor. Hold this position for 10 seconds and then slowly slide back up the wall. Make sure you keep squeezing the pillow or ball throughout this exercise. Repeat 10 times. Build up to 3 sets of 10. • Resisted knee extension: Make a loop from a piece of elastic tubing by tying it around the leg of a table or other fixed object. Step into the loop so the tubing is around the back of your injured leg. Lift your uninjured foot off the ground. Hold onto a chair for balance, if needed. A. Bend your knee about 45 degrees. B. Slowly straighten your leg, keeping your thigh muscle tight as you do this. Do this 10 times. Do 3 sets. An easier way to do this is to perform this exercise while standing on both legs. Written by Tammy White, MS, PT, and Phyllis Clapis PT, MS, OCS. Copyright © 2003 McKesson Health Solutions LLC. All rights reserved.